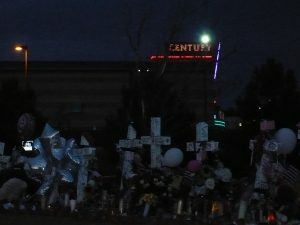 I arose before dawn to visit the site in Aurora. Fewer people, more dramatic light, I thought. 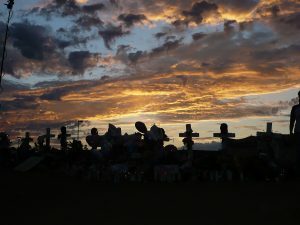 I set about methodically taking pictures, the first few in the dark, then as the sun rose, through the crosses, amazed at the hundred of teddy bears and stuffed animals, the flowers, flags, books, letters, photographs, and candles burning everywhere. As the sun hit the clouds, the the entire scene was illuminated. Another fellow with a long lens said to me, “How’re you holding up?” “Fine,” I told him. I write about crime and pain and loss. Not too long after that I wasn’t fine. I felt it all for the first time.